Chintamani Vinayak Temple, dedicated to Lord Ganesh, is one of the eight Ashtavinayak Temples of Maharashtra. Chintamani Ashta Vinayak Temple is situated at Theur, 25 km south-east of Pune, in Haveli Taluka of Pune District. Theur (Theyoor) is situated at the confluence of the Mula-Mutha, and Bhima rivers. It is believed that once Lord Brahma, the creator, was feeling restless and to ease his mind, he called upon Lord Ganesh. The place where Brahma achieved the serenity is known as the Sthavar region or as Theur. 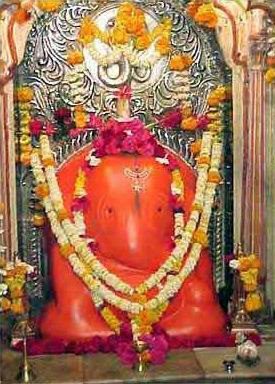 As Lord Brahma’s worries (Chinta) were removed by the Ganesha, Lord Ganesh is known here as Chintamani Vinayak. Chintamani Vinayaka Temple is also closely related to the Maratha ruler, Madhavrao Peshwa and is the 5th Ganesha Temple in the Ashtavinayak Yatra from Pune, Maharashtra. The main entrance of the Chintamani Ashtavinayak Temple at Theur faces north and the Sabhamandap (temple hall) is made up of wood. A small fountain made up of black stone is seen in the hall. The idol of Lord Ganesh faces east and is swayambhu (self emanated), with its trunk turned towards the left side. His eyes are studded with precious stones. An interesting feature of the Chintamani Ganapati Temple is that there is a separate section for meditation, called as Overry. A small temple dedicated to Lord Shiva is there in the premises of this temple. The legend of Theur Chintamani Ganesh Temple is associated with the Chintamani gem. Sage Kapila was holding a gem called Chintaamani which was capable of granting one's desires. Once a young prince (son of Gunavati and Abhijita) by name Guna, visited the sage who offered a great meal to the prince, with the powers of the gem. Captivated by the power of the gem, the prince stole it from the sage. The sage prayed Lord Ganesh for help and the Lord restored the gem from the prince. However the sage refused to accept it and began to call Lord Ganesh as Chintaamani Vinayaka. Since the incident took place under a Kadamba tree, Theyoor was also known as Kadambanagar. Important Hindu Festivals are celebrated at Chintamani Vinayak Temple during the month of Bhadrapad Shuddh (the waxing period) from Pratipada to Saptami (from the first to the sixth) and in the month of Magh Shuddh till the ashtami (eighth day). During these days, the idols of Lord Ganesh in the nearby temples are worshipped and offered Naivedyam. This is called as Dwaryatra. The annual Vinayaka Chaturthi or Ganesh Chaturthi Festival is another major Hindu festival celebrated here which draws thousands of people from across the state. Theur village (Theyoor) is around 25 km south-east of Pune. From Pune, buses are available from Sarasbag or Poolgate bus stand. On Pune - Solapur highway, after Hadapsar and Loni, (about 3 km from Loni), a small road to the left leads to Theur. Pune Junction Railway Station, managed by Central Railways, is the nearest railway station to reach Theur. Mumbai Chennai Express, Mumbai Thiruvananthapuram Express, Deccan Express, Mumbai Hyderabad Express, and Indrayani Express are some of the major trains which passes through Pune Junction Railway Station. Pune Lohegaon Airport, about 10 km from the Pune city, is the nearest airport. Some of the famous tourist attractions near Theur Chintamani Vinayak Temple include the Sarasbaug Ganpati Temple and Garden, Khadakwasla Lake, Lal Mahal, Shaniwar Wada, Raja Dinkar Kelkar Museum, and Aga Khan Palace. Shivaji Fort at Sinhagad or Sinhgad, Pashan Lake, and Kamla Nehru Park at Pune are a few kilometers drive from Theur.